Each car except for the Stewart-Haas No. 10 of Aric Almirola runs a fixed wiper in the sun in a photo from the Monster Energy NASCAR Cup Series race at Sonoma in June. NASCAR teams are great at bending rules until they break, working around new rules that dock car performance, and using existing rules to get an advantage. That last part is why you might see a race car with a windshield wiper sticking straight up on a sunny, dry day, and why NASCAR may start mandating when teams can and can’t have a wiper on their car at road-course races. In true NASCAR fashion, teams found a way to get an aerodynamic advantage out of a wiper, of all things, by running up the windshield in a fixed spot—in a pretty goofy-looking manner. 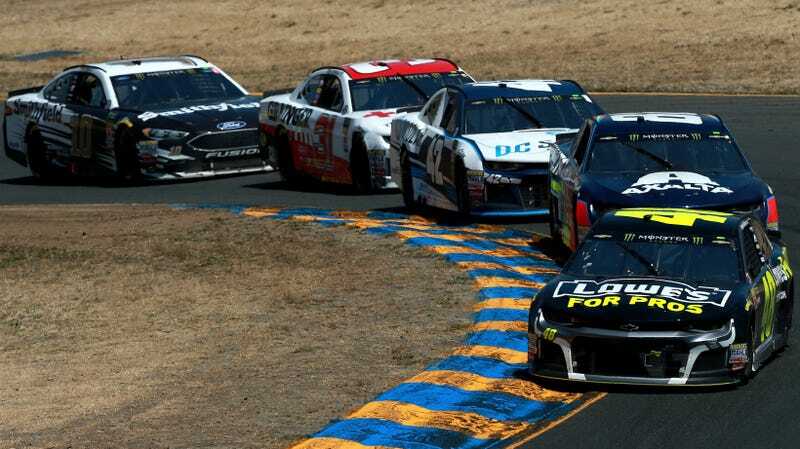 It’s a relatively recent thing at road courses, with photos from the 2016 Sonoma Raceway event appearing to show no cars running a wiper in the sun and only a few teams doing it during a sunny 2017 race. “We’ve typically let them run the wiper blade whether it was dry or whether it was not,” Miller said on SiriusXM NASCAR Radio. “Ironically, that’s on our list for 2019 rules and we will tell them when they can and when they can’t run the windshield wiper blade. If the whole “wipers” thing has been confusing you for a full five paragraphs now, that’s understandable. There are only a few tracks each season where NASCAR will actually let drivers race in the rain and it doesn’t always rain at those tracks, so wipers are hardly relevant—or so most of us thought. NASCAR lets its top three series race in the rain on the road courses, which typically have a more winding layout, lower speeds and more runoff area than the ovals, triangles and squares that make up more than 90 percent of the Monster Energy NASCAR Cup Series schedule. That means cars need rarely used modifications for rain, like swapping racing slicks for tires that have tread and putting on wipers. NASCAR wasn’t telling teams when they could or couldn’t use the wipers at road courses—probably because most normal humans equate the use of wipers with rain, not sun—and teams found an advantage to using them all the time in recent years. Thus, almost every car in a NASCAR field looks like it has a giant piece of hair in its eyes while racing on a road course, because almost every car is using a windshield wiper in full sunlight. 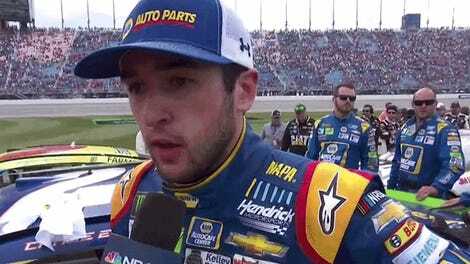 A source with knowledge on NASCAR aero told Jalopnik fixing a wiper to the car gives teams a minor aerodynamic advantage or they wouldn’t do it at all, but that a wiper isn’t going to win or lose a race. Photos from Sonoma Raceway in June show that most cars did run the wiper, though, including race winner Martin Truex Jr.’s Toyota. The Stewart-Haas Racing Fords, which have been dominant this year, didn’t run wipers and all finished in the top 10 there. A photo from Sonoma in June, where all but three cars (the No. 4 of Kevin Harvick, No. 10 of Aric Almirola and No. 21 of Paul Menard) are running a windshield wiper. The race winner, Martin Truex Jr.
NASCAR: where minor performance advantages outweigh goofy appearances, until somebody makes a rule that teams can’t do all of that stuff anymore.